From the time a woman first gets her period during puberty until she stops menstruating in menopause, she may have irregular periods. While irregular periods can occur whenever a woman experiences hormone fluctuations, they are highly common during the menopausal transition. Reported as one of the most common menopause symptoms, it is estimated that up to 90% of women will experience irregular periods during this stage. While they are rarely indicative of health issues, irregular periods can be highly inconvenient. Fortunately, there are readily available remedies that can reduce this symptom. 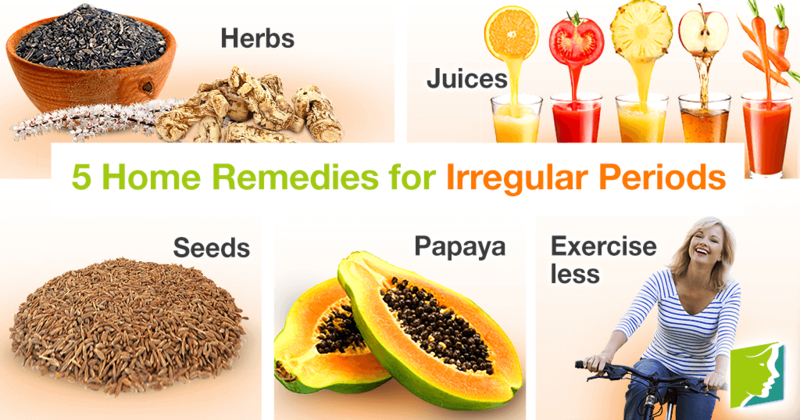 Learn more about how the home remedies that help manage irregular periods. Natural herbs and supplements such as black cohosh and dong quai can help alleviate the duration and frequency of many menopause symptoms, including irregular periods. Herbal teas made with parsley and sage may also help treat irregular periods. Vegetable and fruit juices are good for ensuring that you have enough vitamins and nutrients and can help manage irregular periods. Grape and carrot juice are two of the most common examples. Sesame seeds mixed with cumin seeds and honey are thought to be a great home remedy for irregular periods. In fact, many seeds can be paired with cilantro and coriander to make them more effective. While a diet rich in fruits and vegetables is important for good health, fruits such as papayas have been known to alleviate some menopausal symptoms, including irregular periods. Exercising is not only important for overall well-being, it can help curb many menopause symptoms. 30 of physical activity daily five days a week is recommended for optimal health. However, it is important not to over-exercise, since too much physical activity in the long term can trigger irregular periods. While there are many different hormonal triggers for irregular periods, these five home remedies can reduce the severity and duration of this inconvenient symptom. Click on the following link to learn more about remedies for irregular periods.